The size of Sonoma County is over 1 million acres. 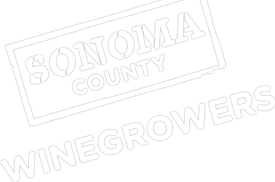 Less than 6% (62,000+ acres) of Sonoma County’s acres are planted to grapes. Less than 1% of Sonoma County’s vineyard acres were impacted by the fires. Grapevines are resilient and acted as a natural firebreak, not only surviving, but helping to slow and stop the spread of wildfires. Warm weather in late August and early September 2017 combined with heat spikes led to a quickened harvest resulting in over 90 percent of the grapes being harvested prior to the fires. Vintners expect the 2017 vintage to be the same world-class wines from Sonoma County that people have come to know and love.